Last night I swung by the Valais Wines Tasting Party at Wringer & Mangle in East London to try some lovely Swiss wines and learn a little about the Valais wine region. I had never tasted Swiss wine before and I’ve never been to Switzerland – and now I’m in the sticky situation of wanting to go to Switzerland and drink more of it. The genie, like the wine, is well and truly out of the bottle. Valais sounds like a magical place. Crystal clean air, alpine peaks, blazing sunrises and the majestic silence of the places nestled midway up mountains. It is said to be one of the most beautiful valleys in the Alps and its wines are described as the hidden jewels of the region. The Valais vines were first cultivated nearly 2000 years ago and were built onto the steep slopes in impressive terraces. Today, the vineyards start in Visperterminen, near the Italian border, and snake along The Rhône, ending at the eastern edge of Lake Geneva in Vouvry. The landscapes of the region are diverse: altitude goes from 400 metres to 4000 metres above sea level; there are microclimates; pines change to flowering almond trees, then to olive trees. 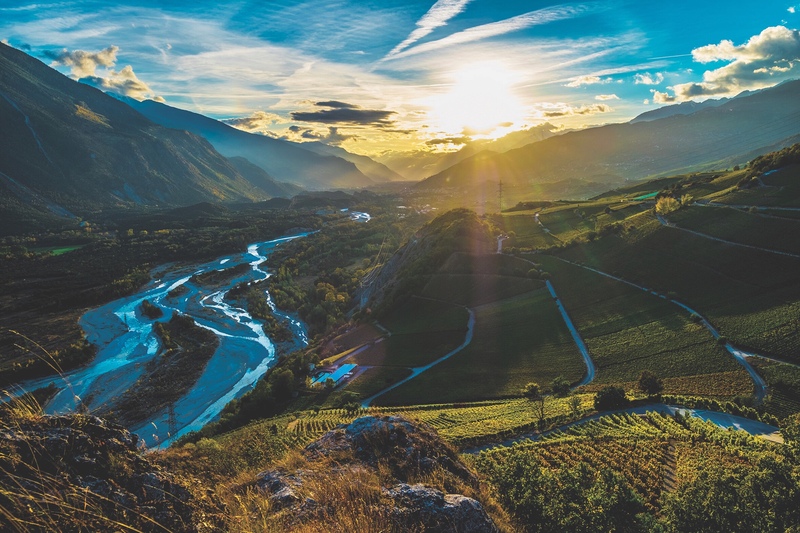 The region has a similar climate to the south of France – it is one of the sunniest regions in central Europe and is Switzerland’s driest canton, with just 600 millimetres of rainfall a year. Located in the heart of the Alps, Valais is sheltered from the rain by the mountains, which also create warm foehn winds that clear away the clouds, resulting in mild temperatures. It also has a large diurnal temperature range (which I’ve been learning about in WSET Level 3 – it means there’s a big difference between the temperature at night and the temperature during the day), which is great news for grapes, as cool nights retain aromas and allow complexity to develop. Because of this, Valais produces some really top quality sweet wines. In fact, loads of different grape varieties can grow in Valais because of the large range of soil types, including granite, chalk and gravel. Swiss wines are said to possess allure, elegance and style – and if wines reflect their landscape, then there’s no doubt that they do. The first wine I tried was the Petite Arvine, Maître de Chais 2017 from Provins Valais. Petite Arvine is a native variety that produces both dry and sweet wines with notes of exotic fruits, a lively acidity and a saline finish. This one was dry with a pronounced nose of peach and mango, with some ripe apple and pear. More tropical fruits showed on the palate, along with a citrus-fresh acidity and a mineral finish. A delicious wine to start on. Their second wine, Heida Chapitre, Les Domaines 2017, was softer – less aromatic but more tropical, with peaches and cream on the finish. Continuing with the whites, I try the Fendant 2018 and the Petite Arvine 2017 from Domaine Thierry Constantin. The winery here is located on the same steep hills of the Rhône Valley, where they experience a microclimate and are very selective with the grapes they pick. The Fendant would be a fabulous aperitif – fresh, salty and mineral, with a little pettilance to dance on the palate. The Petite Arvine was more of a food wine – it was powerful, saline and mineral. The green, slightly underripe, fruits would make it a good pairing with sweet and sour dishes. I really enjoyed the Johannisberg, Chamoson Grand Cru 2017 from Domaine Jean-René Germanier, which is a grape that is identical to Sylvaner, grown in Alsace and Germany. It was floral with a moderate acidity and lychees on the palate. Perfect for Gewurztraminer fans too, like myself. The reds were interesting – mostly pretty fresh and green – just like the mountain slopes, I imagine! The Humagne Rouge, Maître de Chais 2015 from Provins Valais was light and herbaceous, brimming with sour cherries, elderberries and violets, and the Dole Balavaud, Vétroz Grand Cru 2017, made with Pinot Noir and Gamay, was a lovely youthful, fruity wine, which I could devour heartily, glass after glass, in my little alpine lodge, with the late afternoon sunshine glinting off the bright ruby. My favourite though, was the Cornalin 2015 from Domaine Thierry Constantin. With a pronounced nose of red and black fruits (cherries, plums), it had the unmistakable smoky, spicy aromas of oak (as it would after two years in the barrel). Gloriously warming on the palate (it’s 13.4%), it was exactly the kind of wine you’d want after a day spent trailing and trekking through this beautiful region. Swiss wines – I’m sold. I think I’ll have to head to the glaciers. Interesting to read about the complexities of wine from this region.